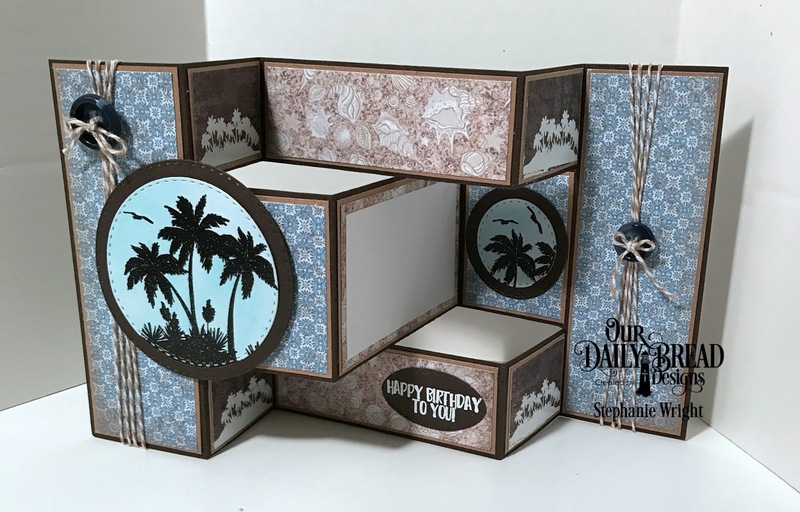 I'm back with another card using the July release stamp set, Bon Voyage, from Our Daily Bread Designs (ODBD). This week I chose to make a Tri-Shutter card. 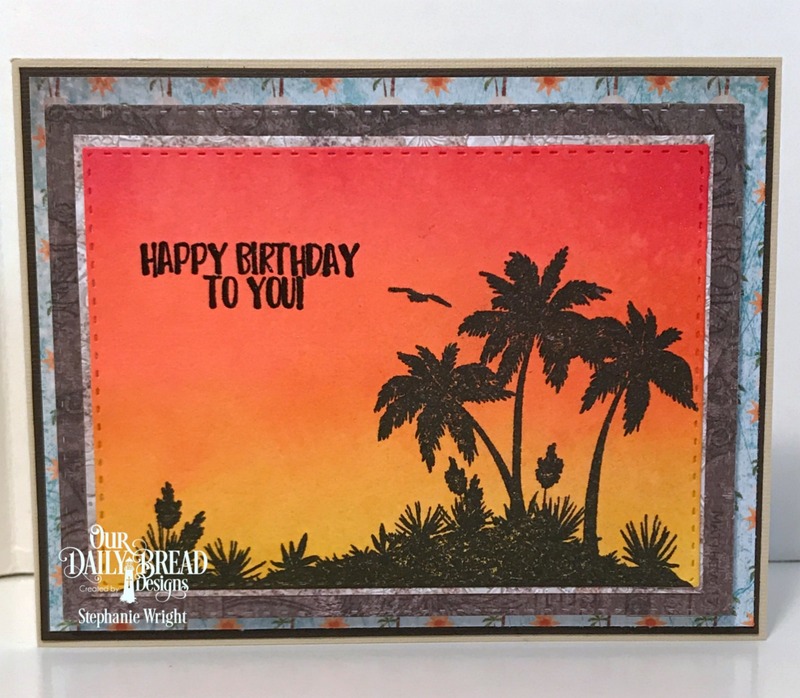 ODBD has a pre-made Tri-Shutter Card base that makes this type of card so easy to put together. However, I didn't have one of their card bases so I made my own. I started with a piece of cardstock that measured 5.5" x 12". On the 12" side I scored it at 2", 4", 8" and 10". Then with the 5.5" side at the top of my trimmer, I slid the cardstock over to the 1.5" mark and then cut between the 2" score mark and the 10" score mark. I repeated this on the other side. 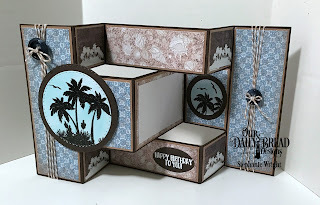 Here is the Tri-Shutter Card tutorial I used from Splitcoast Stampers. 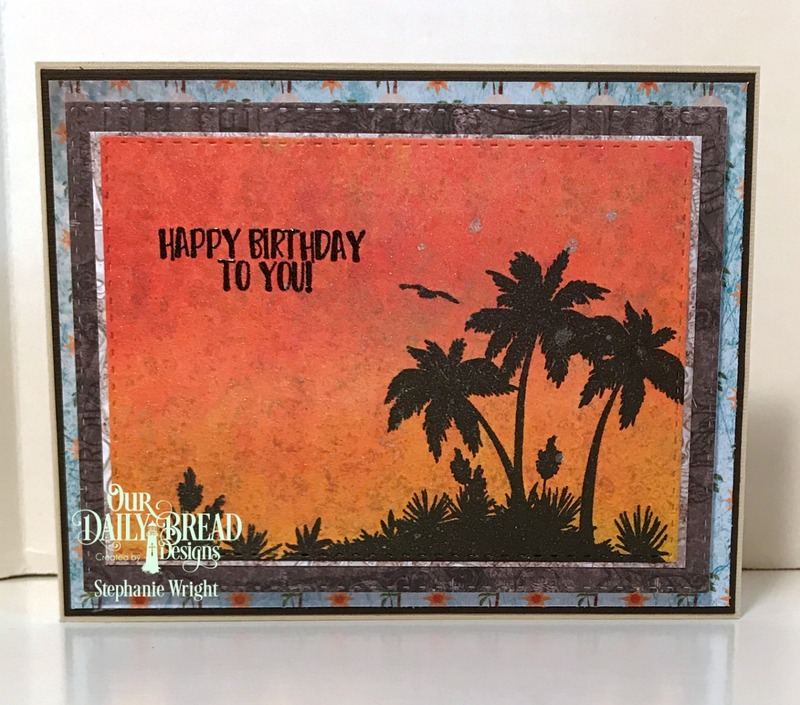 Cardstock mats and patterned papers from the Blooming Garden Collection and the By the Shore Collection cover the card base. The largest image was stamped onto a Double Stitched Circle die cut and then heat embossed. Distress ink was applied to the circle for the sky. Another portion of the largest image was masked and stamped on a smaller circle and a 2nd bird was added before it was also heat embossed. The sentiment was white heat embossed on a Stitched Oval Die Cut. The smaller image was white heat embossed on the small panels of the card. Baker's twine and buttons from my stash add a little extra interest to the vertical panels. The largest interior panel gives a space for writing a message to the recipient. Tools/Embellishments: Simon Says Stamp Fine Detail embossing powder (clear and white), Studio G (baker's twine), buttons from stash. Thanks so much for stopping by to visit today. I hope you'll come back soon. 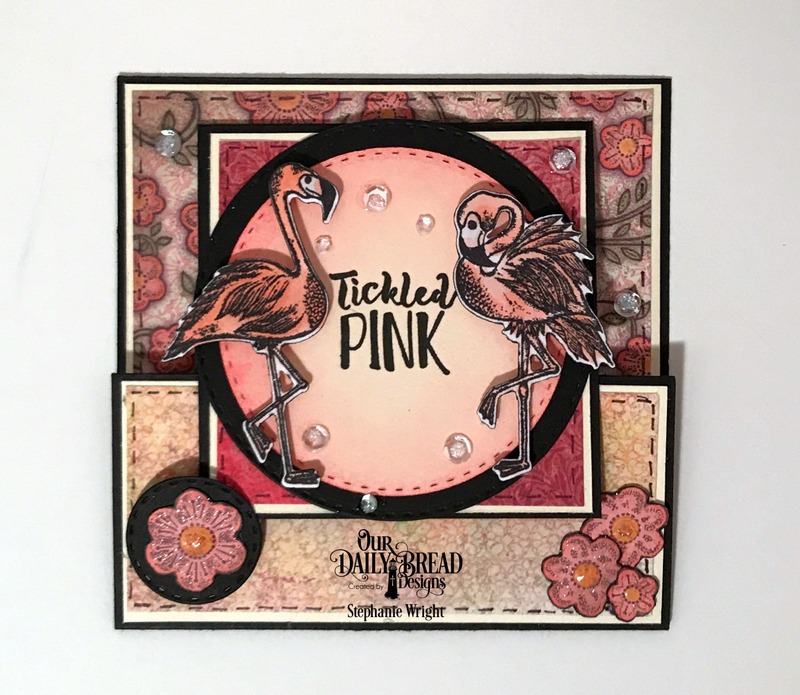 For my card today, I decided the showcase the beautiful flamingos in the Tickled Pink stamp set on a Joy-Fold Card. 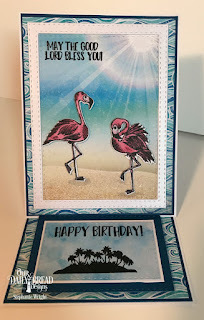 I used the video tutorial found here for my version of this card. The finished card is 4.25" square. The base cardstock measures 6.25" x 4.25" scored at 4.25" on the long side. The insert piece measures 6" x 3" and is scored at 3" on the long side. 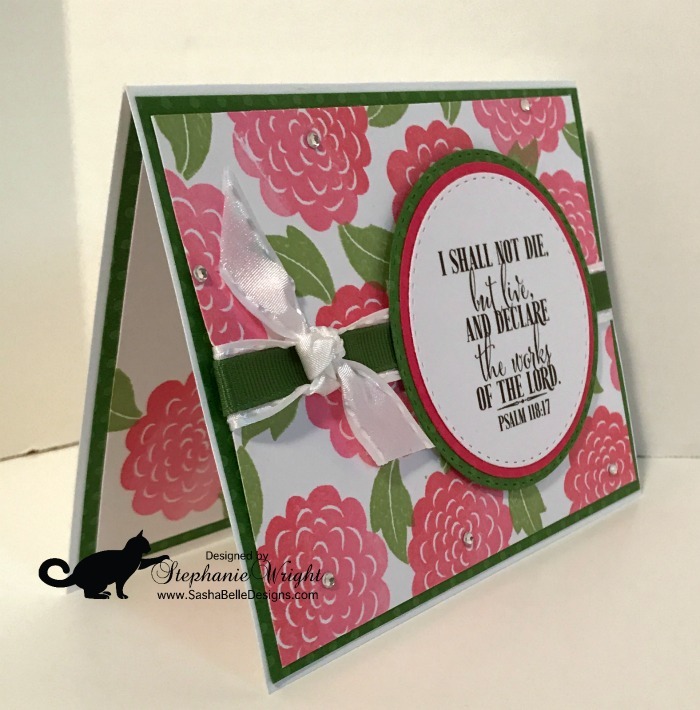 The base pieces are decorated with papers from the Blooming Garden Collection Paper Pad. The sentiment was stamped in the middle of an inked die cut Double Stitched Circle. The circle was matted and adhered to the insert piece. 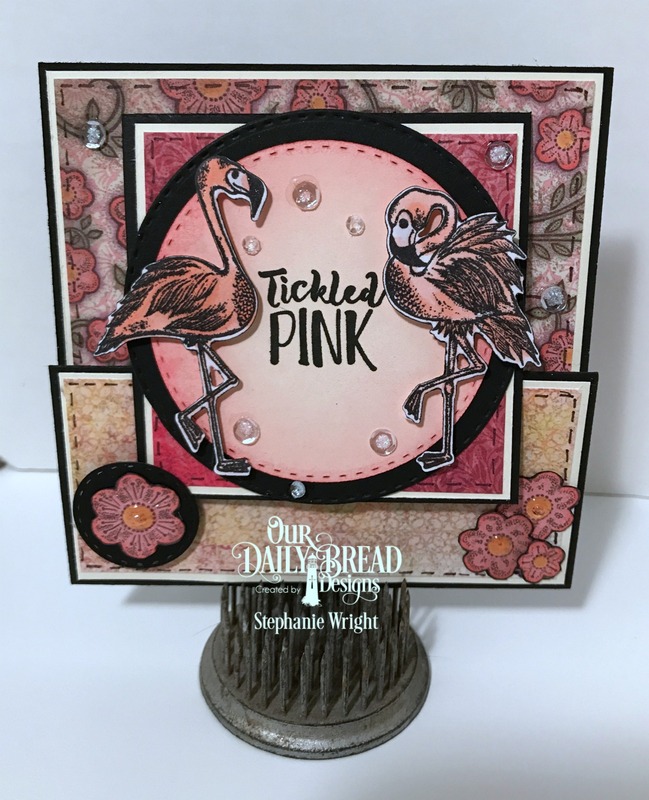 The flamingos were stamped and colored with Copics before being die cut with the coordinating Flamingo dies.They were popped up on the sentiment circle. A fine tip black pen was used for faux stitching on each panel. More papers from the same collection are used on the interior. 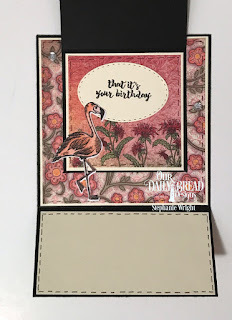 The birthday sentiment was stamped inside a Stitched Circle die cut. 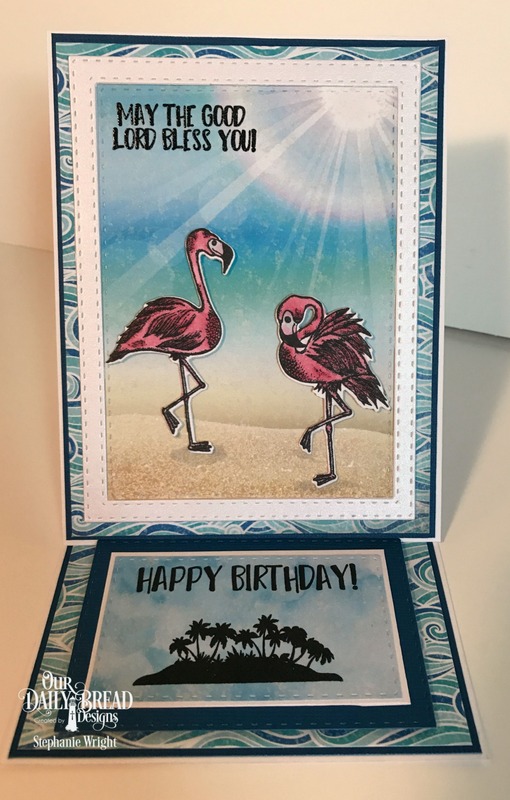 Another Copic colored and die cut flamingo was added to carry the flamingo theme to the inside of the card. The plain cardstock panel allows room for a message to the recipient. 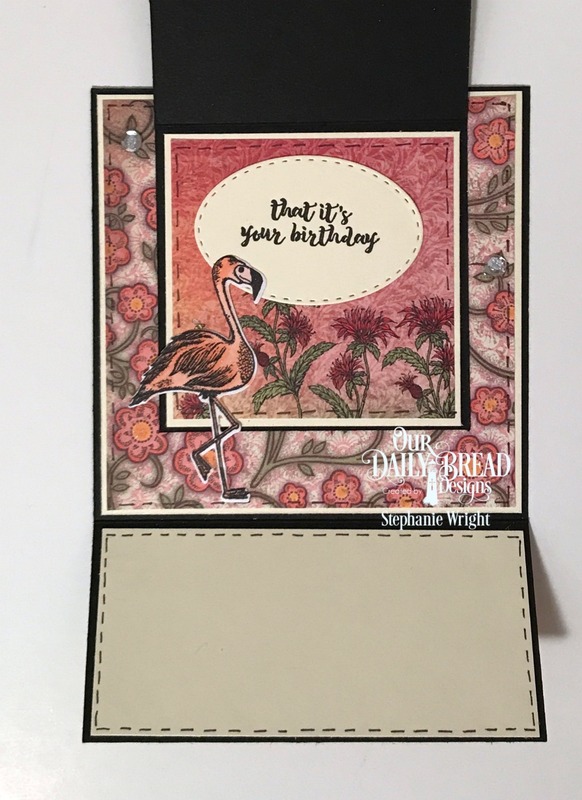 When closed, the left edge of the insert is tucked behind the single fussy cut flower (from one of the patterned papers) that was adhered to a circle die cut before being popped up over the background papers. Three more fussy cut flowers are used as added embellishments. 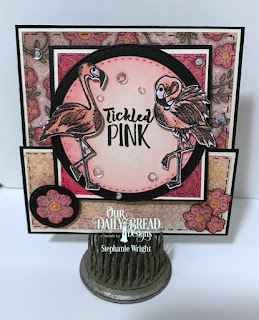 The flower centers have Glossy Accents added to them while the flower petals and the flamingos have a couple coats of clear Wink of Stella to help them shine. As a finishing touch, some sequins topped with stickles were added to the card front. Happy Wednesday!! It's time for a new challenge at Word Art Wednesday. This week we are focusing on Isaiah 43:25, "I, even I, am he that blotteth out thy transgressions for mine own sake, and will not remember thy sins." We read in 1John 1:9 that, "if we confess our sins he is faithful and just to forgive us our sins and to cleanse us from all unrighteousness." When we sin, and we all do, God has promised that if we will confess those sins, He will forgive us. Our focus verse this week says that He will blot them out and not remember them. WOW!! What a loving and merciful God we have. Some would say this gives us a license to do whatever we want. Not so. For one thing, while God does forgive us of our sins, we still must bear the consequences of those sins. (If I am arrested for stealing, the Lord will forgive me of the theft but I must still serve my time in jail.) But even more importantly, when I think about all the things the Lord has done for me, why would I want to hurt Him by doing things that I know are displeasing to Him? Our verse this week is a great comfort for those times when I fail. We have such wonderful sponsors at Word Art Wednesday! This week our sponsor is Simon Says Stamp. Truly one-stop-shopping!! For my card this week I used their A2 Card Curved Edge Die to make the curved panel and mat on my card. There is a sample card in the die's gallery that gave me inspiration for the card design. However, when I turned the card sideways, to better fit the verse, it reminded me of a clutch purse. So, I added the bling as the clasp on my purse. 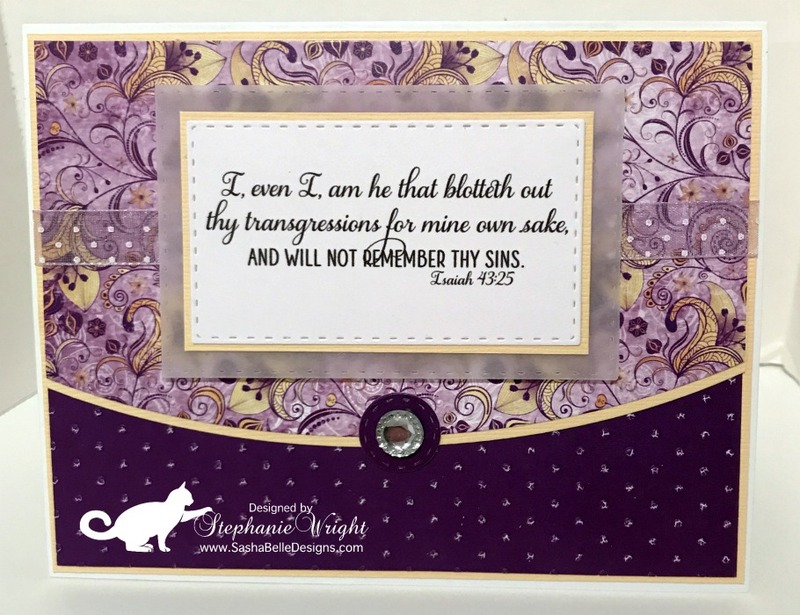 An embossing folder used on the solid purple panel adds texture and interest. The sheer dotted swiss ribbon under the verse adds a subtle touch as does the vellum mat under the matted verse panel. I hope you will have the time to stop by the Word Art Wednesday blog to see the project from the rest of the design team and to pick up your free digi. Also, please visit our wonderful sponsor, Simon Says Stamp, for all your online crafty shopping needs and to tell them thank you for their generosity in sponsoring Word Art Wednesday every month. 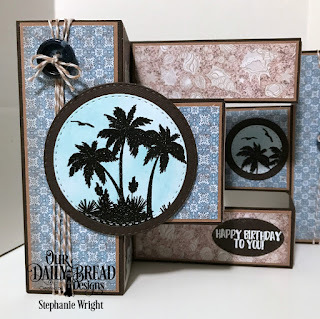 Please check back later today for my next Guest Designer post for Our Daily Bread Designs. You can scroll up one post or click here. Thanks for visiting with me today. I'm back with another project for Our Daily Bread Designs. Today I'm playing with the Bon Voyage set. 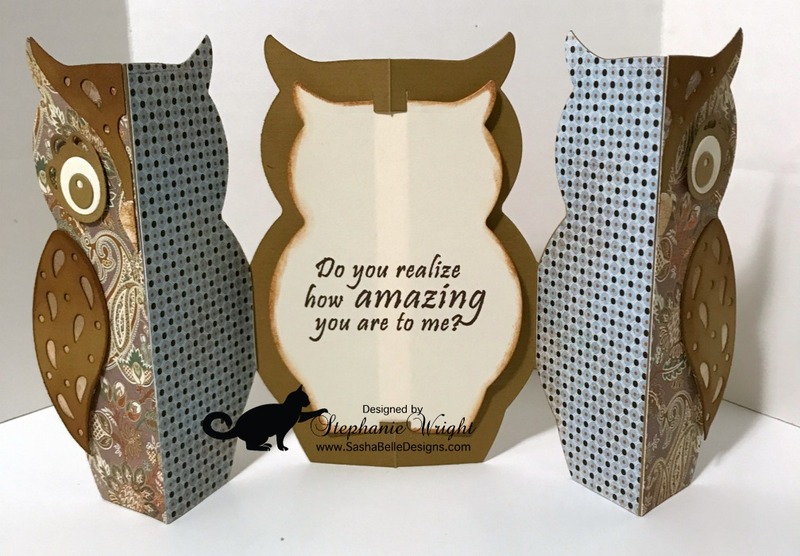 This set is perfect for inked backgrounds and dark stamping on top. I have two versions of this card to show you today. They are exactly alike except for the paper used for the inked background and the type of spritz applied after inking. For the card shown above I used three colors of distress ink blended onto white cardstock. I then spritzed the inked panel with a shimmer mist made of Perfect Pearls mixed with water. The image was stamped with black ink using my MISTI so that I could stamp multiple times to make sure it was completely black. Then I die cut the panel with the next to the largest Double Stitched Rectangle die. The sentiment was stamped in black ink and then clear heat embossed. After matting it with the sea shell paper in the By the Shore paper pad, it was matted again with the darkest paper in the Blooming Garden paper pad that had been die cut with the largest Double Stitched Rectangle die. This panel was then popped up with craft foam over the palm tree paper in the By the Shore paper pad. This second card was assembled the same way and inked with the same ink colors. However, instead of inking up white cardstock for the background, I inked up one of the lighter papers in the Blooming Garden paper pad and then spritzed it with a silver shimmer spray. Using the patterned paper gives more texture but also a more muted look. Thanks for stopping by for a visit today. I hope you'll come again soon. Hello! I hope you had a good day yesterday and for my American friends, were able to spend time celebrating Independence Day with those you love. It's time for another challenge at Word Art Wednesday. 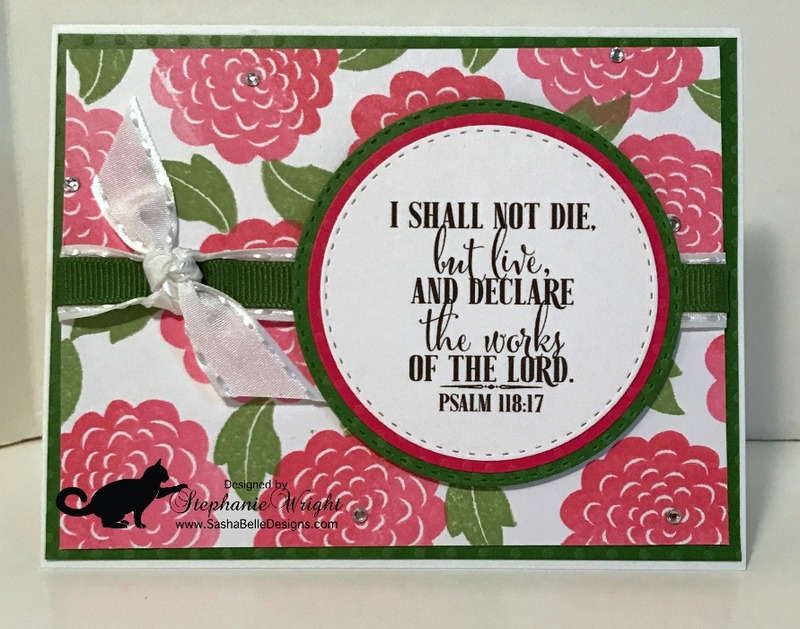 This week our focus verse is Psalm 118:17, "I shall not die, but live, and declare the works of the Lord." According to commentators, this Psalm was probably the dedication of the restored walls and gates of Jerusalem during the Feast of Tabernacles in 444BC in the time of Ezra and Nehemiah. During the rebuilding of the walls, the Jews were surrounded by enemies who first tried to discourage them through ridicule and then threatened them with violence. Our focus verse is a testimony that in spite of the enemies surrounding them, they did not die during the rebuilding but lived to declare the things the Lord had done for them. So often in our lives today, we face the same thing. We're trying to do what the Lord wants us to do and the enemy sends discouragement in the form of ridicule and, in some cases, physical harm. However, verse 6 of this same chapter states, "The Lord is on my side; I will not fear: what can man do unto me?" Like the Israelites of old, we must trust the Lord and keep doing the task He's given us to do. For my card today, I chose to make my own background with stamps. Recently, on Instagram, Amuse Studio offered a stamp set for free with $2 shipping. I didn't have any of their stamps and I liked the looks of the set so I thought I'd give it a try. I am so glad I did. The set arrived very quickly in my mailbox. The red rubber cling set includes the flower image, two leaves and two sentiments. I used one of the leaf stamps and the flower for my background today. They stamped very crisply right out of the package. A Hero Arts Ombre ink pad gives the flowers some color variation. I stamped the flower randomly on some white cardstock and then filled in the spaces with leaves. After trimming the panel down slightly, two ribbons were layered across the panel and a separate white ribbon was knotted off to the left side. This panel was matted on green cardstock before being adhered to the card base. The verse panel was double matted and popped up with foam squares over the ribbon. Some small gems in the flower centers finish off the card. I couldn't resist doing a little interior decorating with the flower and leaf stamps. I'll definitely be reaching for this set again! Thanks for visiting with me today. Please come back later today as I have a fun announcement and another project to show you. I found the the Sizzix Owl Label Fold-a-Long Thinlets Die set on clearance at a local store but didn't buy it because my craft fund was depleted (I do *try* to be good). My husband insisted I tell him where it was in the store and went back to purchase it for me. I love his support of my obsession hobby. Of course, I figured it was only fair that he get the first card made with the die. 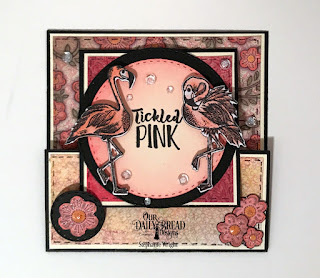 I watched a couple YouTube videos to see how others had used it (specifically Jen Long and Christina Thomas) and combined some of their ideas to make this card. 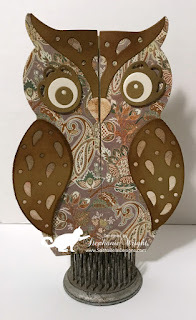 However, for the patterned paper owls, I lay the full-size owl on a single layer of patterned paper and then used the fold marks as lines for cutting the owls in half. This way I didn't have to get myself confused on which way the owl needed to be for the two sides. I've had the sentiment stamp for awhile and had been waiting for the perfect card to use it for my husband. I used distress inks for shading the wings, head pieces, eyelashes and insert. The finished card fits in a normal A2 sized envelope. 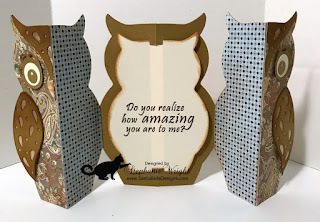 Note: The card base die leaves a space in the back that is covered by the owl insert. When I make it again, I may back light colored inserts with a base colored owl to help disguise it this space. Thanks for stopping by for a visit. I hope you'll come back again soon.